Bandai Namco has updated their Project X Zone official site to include some screens, artwork, and voice samples for Tron Bonne and her Servbot. You'll find Tron's page here and the Servbot's page here. The update also includes messages from the characters' voice actresses, Mayumi Izuka and Chisa Yokoyama. I don't have a translation of that at the moment, but it's bound to show up sometime soon. Soonish. UPDATE: That didn't take long. Hit the jump below for the translated comments! "Hello Everyone, I’m Iizuka Mayumi, playing Tron Bonne. Wow, it’s already been over 10 years since I met Tron! But I still feel very happy about this reunion with her. She’s so energetic and positive…well she’s sometimes also stubborn and clumsy. whenever I act as her, I think that I have so many things in common with her, too, but she’s the one who always gives me lot of energy. Anyway, It seems like a lot of characters from many different games are joining this game! I’d be so happy if Tron becomes a help to you and you like her amongst them! So! 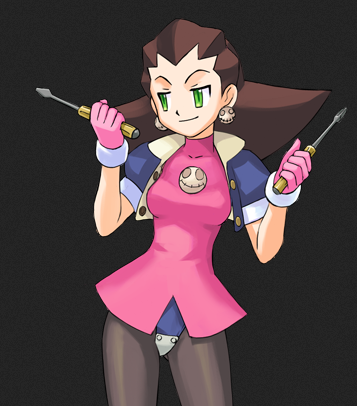 This is Iizuka Mayumi as Tron Bonne! See you!" "Hi, This is Chisa Yokoyama as the Servbots. Well, actually I’m already appearing in this game as another character….Sakura Shinguji. I wouldn’t ever think that both of those characters could appear in same game, but I was so happy seeing the scene when the Servbot says “Imperial Flower Combat Troop!” because I love him very much, too. And one more thing I’m happy about… a game I’m totally crazy over, Street Fighter II, well, I got to say “Hadouken!” as a Servbot. 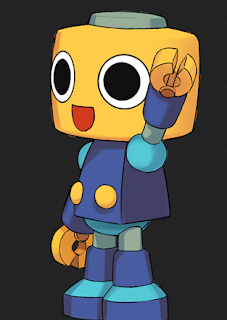 So, since I absolutely want everyone to hear this, please play this game with Servbots! By the way, to tell you how much I love Servbots, I even have a Servbot head which becomes a neat mug when I take the cap on its top. I really treasure this mug. Protodude, there are also comments from the voice actors of X and Zero. It would be great if we could get those translated somehow too. I already have translated it. you can read them if you find the old article about X and Zero in PXZ. Anmushen - not sure if you'll read this, but I've spent the last while searching the site of the voice actor comments for X and Zero and haven't found them. Sorry if I'm missing them somewhere.